At CES 2018, BodyGuardz introduced SpyGlass 2 with AlumiTech, a new thinner yet stronger, two-way privacy glass that hides content from onlookers. SpyGlass 2 maintains our leading privacy coating, while adding AlumiTech for even greater screen drop protection. 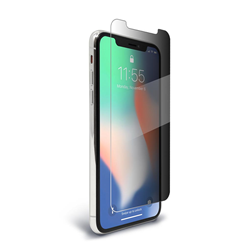 BodyGuardz®, the leader in device protection innovation, announces Spyglass® 2 featuring AlumiTech™—a new thinner yet stronger, two-way privacy glass that hides content from onlookers while delivering world-class screen protection from cracks and breaks. By leveraging next-gen aluminosilicate glass, SpyGlass 2 delivers incredible strength and protection with a thin .33mm form factor. It is optically clear, completely touch sensitive and limits the visibility of fingerprint smudges. In addition, SpyGlass 2 features BodyGuardz Installation Guide for easy protector installation in moments. SpyGlass 2 is available for iPhone X, 8 and 7 (in all size variants). Founded in 2002, BodyGuardz is committed to offering top-quality solutions and services at competitive prices. The company prides itself in providing products, service and delivery that customers notice as a step above the rest. BodyGuardz designs reliable mobile device accessories that keep up with today’s active lifestyles. To learn more, visit BodyGuardz. BGZ brands’ mission is “to enhance our customers’ lifestyles through branded products and services of elevated value and quality.” Formerly known as BodyGuardz, BGZ brands has become the powerhouse parent company of three distinct consumer electronic accessory brands—BodyGuardz, a leading device protection company; Lander®, gear made modern™; and MOXYO®, modern accessories for you. For more information, visit BGZ brands.